Ten years ago I set out to express my vision of the antediluvian world through an epic tale that would link Plato’s myth of Atlantis with the Creation story from the book of Genesis. Originally this was meant to be more of an exploration of the world that existed before the "great cataclysm"—best known as the great flood described in Genesis and several other ancient texts. The way I envisioned this world, the theory of Pangaea blended with the Biblical idea of underground springs that watered the land to form a massive continent set atop vast pockets of subterranean water. The thought that prehistoric creatures such as giant lizards and crustaceans now extinct might have shared this world with man also begged to be expressed. Into this world I envisioned a civilization—the Atlantic empire—and a way of life now lost to us. This was not an age of cavemen and clubs. This was an age of tools and machines, of ships that sailed the four rivers of Eden, and of great cities built by men. It was an age of mighty beasts, of dragons and wyverns and battle-lizards, and the clever men who dared tame them. I also sought to clarify the legend of Adam and Eve—specifically their banishment. So many Bible story books show Adam and Eve wandering in a dry, barren wilderness, but if four rivers flowed out of that garden, mankind would not have had to wander far to find fertile farmland. …In fact, they would have only had to walk beyond the reach of those angels with the flaming swords. Researching the guardians of Eden is where this story came alive. I already knew how it ended, but as I read Genesis 6:4—a single, vague passage that describes the children of angels who roamed the earth in those days—the Word spoke to me so powerfully that the hair on the back of my neck stood on end. When I was a teenager I invented the non-parallel world of Shift and a series of adventures shared among travelers who crossed between the many diverse worlds that Shift connected. These worlds evolved over the years into different expressions of the diverse, often confusing, collection of beliefs, philosophies, and teachings that make up the Christian faith. When I started teaching elementary-age Sunday school, I wished for a medium that would engage my audience and at the same time provide illustrations they could apply in their own lives. I also wished for a kind of “cliff-hanger curriculum” that could compete against the video games, the internet, and the television that pulls children away from Christian fellowship and Bible education. The end result of this wishing is this book and the series to follow. Tales of Vantoria, The Sarian’s Sword is a morality tale that reads like a page-turner. 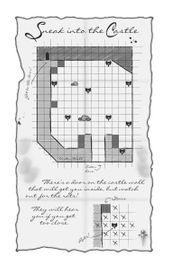 It is a Bible study hidden in mysterious puzzle and activity pages. It is an adventure full of monsters, perils, and a collection of powerful Christian messages. Because I designed this book as a Bible study, I have given permission for readers to make copies of the activity pages so that the book can be used multiple times. I hope that the world of Shift is as fun for you to explore as it was for me to write and create. 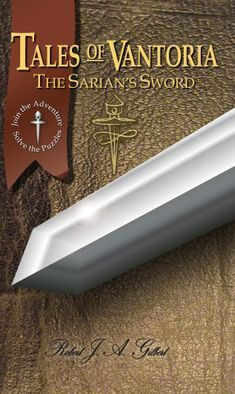 Tales of Vantoria, the Sarian's Sword, is available in paperback and ebook. Due to the compressed nature of ebook files, however, the puzzles are not featured in the ebook versions. I watched with wary anticipation as the bedraggled vagabond sauntered nearer to the toddling blonde. The child played unaware on the sidewalk out in front of her grandmother’s apartment. Having plenty of experience with both crime and the city’s homeless population, I was on full alert, observing the man’s swaying walk, trying to discern what drugs he might be on, what purpose he might have for looking so intently at the child I was there to protect. I wasn’t really there to protect Alexis. I was there to help grandmother watch her until the irresponsible mother returned from partying with friends. But the paladin spirit inside of me had already sworn fealty to this beautiful young maiden, and I was prepared to do combat with a man whose lack of sobriety might have given him ten times the strength of a normal man. A few weeks later, Alexis was gone. The sheriff came and took her away, and I never saw her again. Her mother was supposed to be fighting a custody battle in the courts. Instead, she was failing her own drug tests. I had done what I could. In the end, only Alexis’ mother could save her, and that woman could not even save herself. To this day, I can still hear that homeless man’s voice ringing in my ears. We’re all children of God: the bum on the street, the mother in the tavern, and even me. The question is: should we continue to act like children? And who gets hurt when we do? I was not always the paladin. The protector. The defender of the weak and the vulnerable. As a kid, I was just as selfish, just as reckless, as anybody else. I didn’t start standing up for the underdog until I had been one myself. At first, I was only doing for others what I wished had been done for me. But as I grew older, I began to experience an innate desire not only to protect those who could not defend themselves, but to strengthen those whose battles were far too great to be fought alone. When I married, my wife joined me in these struggles, taking on a position in Children’s ministries at our local church, joining a community charity organization to help young mothers with diaper and formula expenses, and advocating for children in our own neighborhood. What we discovered, however, was that even God could not help us save people…from themselves. The story of Mary and Renaud was originally conceived as the back-story for a book I began about their son. Mary comes from the world of luck and grace, where God’s ever-present protection has caused her to become a little too reckless for her own good. Renaud is strong and tough, but cautious. He does not charge into a battle with the assumption that God will deliver him. Their contrasting personalities form a wonderful backdrop to the question my paladin nature keeps having to ask: how much of our salvation is our own responsibility, and how much should we entrust to God? And more importantly: how can we expect to save others if we cannot even save ourselves? Click here to play the first puzzle online! click here to download the activity pages!